The ensemble of the Great Oranienbaum (Menshikov) Palace – is an outstanding architectural monument of the first half of XVIII century. It was founded by the Duke Alexander Menshikov in 1711 by the project of the architect F. Fontana. The construction of the central building of the palace was completed in 1716 under the supervision of the architect, I. Braunstein. At the same time, there were built the curved wings of the palace, adjacent to the main building from the east and west sides. In 1717, the Lower Garden was set in front of the palace, and, in 1919, there were erected the tower pavilions. The interiors of the palace were finished by 1720. The palace church was consecrated on September 3, 1727. After the fall of the Duke Menshikov, the Palace was handed over to the Office of the buildings, and in 1736 – the Admiralty College Hospital. In 1743, the Oranienbaum estate became the property of the Grand Duke Peter Fedorovich. During the Soviet Era, the Palace had played different roles, but not a museum. It was used as a hospital, rural school, a college and a dormitory. Only in 1995 the restoration works had started here. 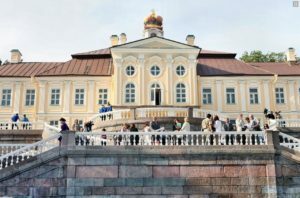 Finally, the restored and renovated Great Menshikov Palace in Oranienbaum, was opened to the public in summer of 2011. The opening of the palace was devoted to the 300-th anniversary of the town Lomonosov.